Originally from Quebec, he spent over five years exploring Europe and South America before travelling across Canada, eventually ending up at the end of the road here in Tofino. Daniel handcrafts furniture from salvaged western red cedar--beautiful and eco friendly. Daniel's collapsible designs are easy to transport and shipped worldwide. What started as a home-based business on Chesterman Beach has now grown to require a larger space in the big red building on Industrial Way, where it has been operating for the past six months. Just look for the patio display. 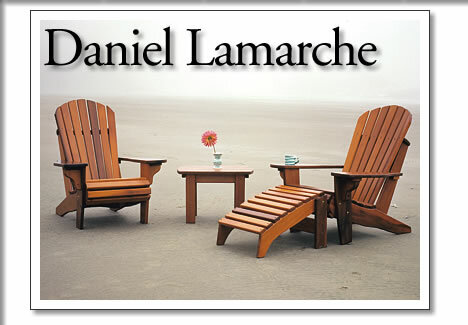 Daniel Lamarche sells his furniture from his workshop at Unit 6, 671 Industrial Way, Tofino. He is also a participant in the Tofino Artist Studio Tour. Tofino artist Daniel Lamarche handcrafts furniture from salvaged western red cedar. His collapsible designs are easy to transport and are shipped around the world.